Nowadays, the medicine is almost an essential element which is almost important in the lives of the people. The medicines are similarly important in the lives of the people along with the air and the water. The medicines can give a new life to the human while the lack of them can seriously take a life. Like the other essentials of life, medicines are also sometimes out of the league for the poor and lower income people. Thus, many deaths occur in our country due to lack of medicines in the right time. The medicine bank can be an answer to the above lacunae. There are still people with a great heart to offer these lifesaving medicines to the poor and needy. A resident of the capital city Delhi has taken an initiative to collect these medicines from the rich and middle-class people and started a free medicine bank for the poor. The man named Omkar Nath Sharma is a retired blood bank technician. The man is called Medicine Baba (Medicine Man) who is a god for the poor and needy people. The medicine man even in his 79 years, every day wore a saffron kurta and walks in the streets of the Delhi. 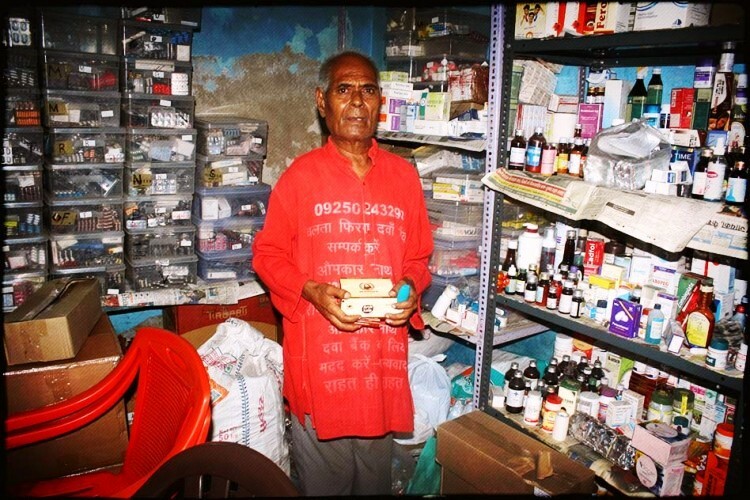 He collects medicines from the rich and middle-class people who sometimes forget that they have excess medicines lying in their homes. 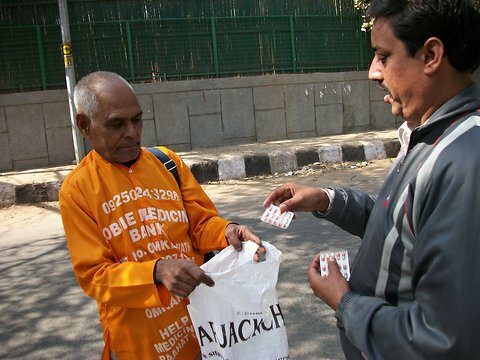 Omkar Nath Sharma normally makes his journey through the upscale part of the capital city and encourages the residents to donate their excess medicines to him. According to him, in a country where more than 65% of the population suffers due to lack of medicines, the free medicine bank for the poor people of Medicine Baba helps the poor to survive the death. Along with collecting the medicine, he also wants to create the awareness among the people. So that people doesn’t through away the prescribed medicine if they are not useful to them anymore. This wonder man was born around 1940’s. A childhood accident had left him slightly limped when he was only 12. His work as Medicine man stated during the year 2008 when an under-construction metro bridge had collapsed in Delhi. He had witnessed the suffering of the injured people who were sent home with just first aid due to lack of medicines. The people were left on the verge of life threatening decision due to lack of tangible resources. This incident had shaken Omkar Nath Sharma and thus he initiated his work for the Mobile medicine bank which later had saved the lives of million poor people. Omkar Nath Sharma doesn’t take the safety issues lightly; he collects the medicines after checking the expiry dates. He collected the medicines by notifying the manufacturers, expiry dates so that no one gets affected by his medicines. He walks around 6-7 kilometers per day to collect the excess medicines from the rich people. He is not rich enough to afford the fare of comfortable metro rail, so he normally travels by bus. If there is the unavailability of buses in any remote area, he simply walks. He had set up a dispensary in his home at the Manglapuri basti, where he lives with his wife and mentally challenged son. The story of Medicine Baba is opted to create the awareness among all the society to save thousands of lives which get wasted due to lack of proper medicine. Only the initiatives of the whole society can save people from the early death.